Rider gave me opportunities to strengthen my writing, speaking and leadership skills. John visited campus at the suggestion of a high school music teacher who knew he was interested in finance. “My teacher said Rider had a good business program,” says John, who lived in West Babylon, NY. During his visit, he toured the campus and sat in on classes. “I fell in love with it,” he says. “I loved the way Rider treated us. I felt at home.” Other colleges just didn’t compare. John started out as finance major but switched to English midway through his sophomore year. He credits his decision to “transformational” moments involving faculty and classes in the English department. With encouragement from his professors, John set his sights on grad school with plans of becoming a university English professor. “Applying to grad school is a dizzying process. The faculty worked with me, showing me different ways to do essays and advising me on coursework and independent research,” he says. Dr. Kelly Ross — like him, a big fan of William Faulkner — helped him to pursue independent study into the Nobel Prize winner. When he realized the novelist had been the first writer-in-residence at University of Virginia (UVA) and the school had a huge Faulkner collection, its top-ranked English program became his first-choice graduate school. 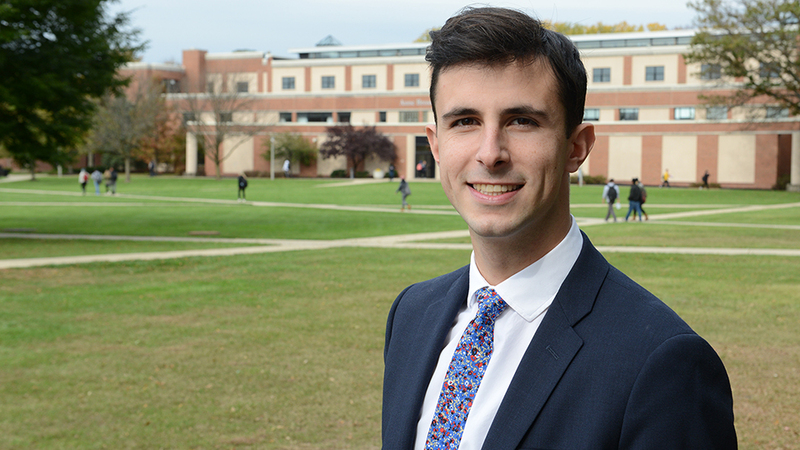 Although shy and introverted as a freshman, John joined Rider’s Student Government Association at the encouragement of his orientation leader and became a senate aide. John eventually was elected SGA vice president and president. He worked with students, faculty and staff on various committees, lobbied for student voting rights on academic policy committees and representation on Rider’s Board of Trustees, and co-founded the Committee on LGBTQ Affairs. John’s positive experience as new student inspired him to become an Orientation Leader. He went through intensive training to learn how to support students during their transition to college life. He also worked as a Student-for-a-Day coordinator. “It was so rewarding. We helped new students see the opportunities available to them at Rider,” he says. As a Rider student, John worked on three different independent research projects. In one of his first required English classes, he wrote a paper on “Go Set a Watchman” by Harper Lee, author of “To Kill a Mockingbird.” His professor, Dr. Nowell Marshall, encouraged him to further develop his argument, which led to a $5,000 Undergraduate Research Scholar Award. His yearlong research project culminated in a study guide that was implemented at his high school in West Babylon, NY. John’s love for English carried over into volunteer work through Rider’s Petey Green Program, tutoring prisoners at New Jersey correctional facilities in reading comprehension and writing. He also worked as a tutor in Rider’s English department. I had incredible learning experiences with the Rider faculty, and I grew exponentially through my experiences outside the classroom. That confluence of experiences inside and outside the classroom molded me.